Wing span: 2 1/2 - 3 1/16 inches (6.4 - 7.8 cm). Identification: Upperside is orange-brown with darker wing bases and black spots; a single white spot on leading edge of each wing. 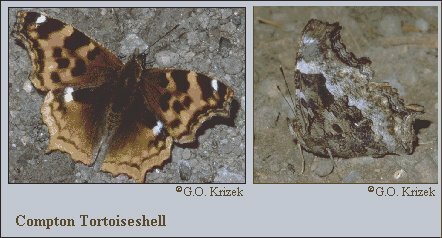 Underside is mottled gray and brown, with dark bases and borders; hindwing with small white V at outer end of cell. Life history: Eggs are laid in clumps on the host plant, and caterpillars feed together. Adults hibernate, sometimes in groups. Flight: One brood: Overwintered adults emerge in May to mate and lay eggs of the next generation, which flies from July-November before hibernating. Caterpillar hosts: Aspen and cottonwood (Populus), willows (Salix), gray birch (Betula populifolia), and paper birch (B. papyrifera). Adult food: Sap, rotting fruit, nectar of willow flowers. Habitat: Upland deciduous or coniferous forests. Range: Southeast Alaska and Canada south in the mountains to Montana and Wyoming; east across southern Canada and the northern United States to New England; south to North Carolina and Missouri. Rare migrants to Newfoundland, Nebraska, and Florida. This species is also found in temperate Eurasia.